There are times when our heavy heart-burdens cry so loudly that we struggle to hear the voice of Peace and to remember the unsearchable, inescapable presence of God; times when our prayers seem to go unanswered and our broken situations seem unfixable … and painful. Oh, so painful! We can’t get through this life without knowing ache. He knows all about your heart-burdens. Read Isaiah 43:1-3,5a. Identify the promises found in this passage. Do you believe that this is the heart of God for all of His children… including you? Journal your answer or CLICK HERE to leave a comment and take the conversation deeper. I co-wrote and recorded a song called Power In His Presence as a part of the soundtrack for my book, I WANT IT ALL. I believe it will encourage your heart today in worship. 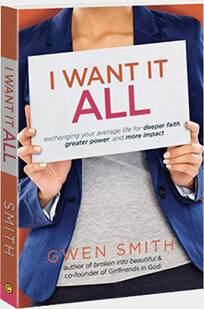 We’re excited to announce the upcoming online book and Bible study of “I WANT IT ALL.” Sign up for the study, get your copy of the book, invite a few friends & mark your calendar. 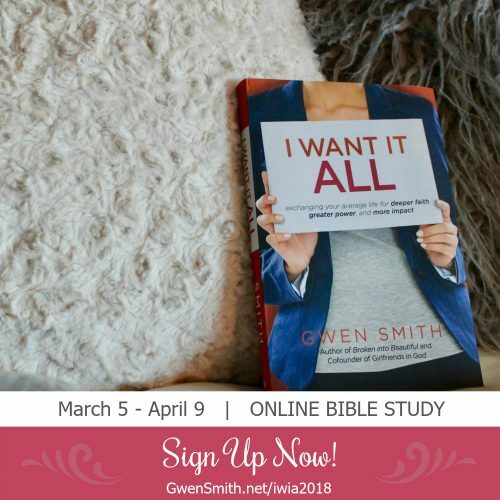 The I WANT IT ALL Online Study will be hosted LIVE each week with Gwen on a private online FB community, and will run from March 5th – April 9th. My heart breaks that she doesn’t want to see either me or my brother (and that she doesn’t want to know the Lord). I have cried bitter tears of sorrow, I just lost my wife of 34 years just before our next anniversary. Denis, I am so greatly sorry for your loss! Saying a prayer for you and your family now! God knew I needed this today! Struggling with some fear, as I step out of my old life and into a new. God reminded me with the scripture, that he has “redeemed ME, summoned ME by my name, and I am HIS” ,and not to fear this walk, He’s got me. Thank you for your faithfulness. I just began receiving the daily devotionals and they are so encouraging! I am deeply moved and touched by the Power of the Holly Spirit,after reading this passage and listening yo the song… Gwen you are truly blessed and you have truly blessed some of us. We thank the Lord for you. Stay more and more blessed. 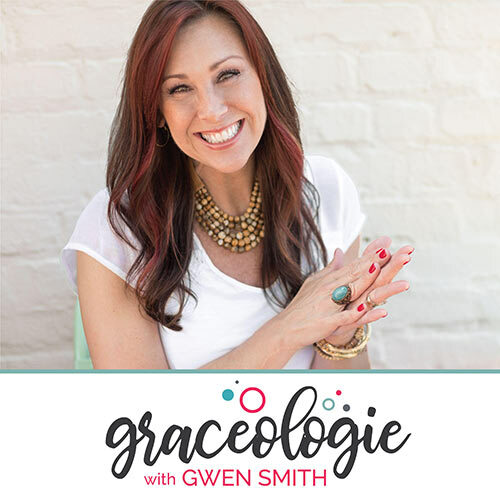 Gwen, I want to thank you and the ladies for sharing your inspirational stories and love for the Lord, it has truly gotten me thru some very tough times. Gwen, you have been the answer to the deep ache of my heart-burden’s cry. I have felt like I’m drowning because of marriage problems that were bringing me to a place of hopelessness and was ready to make the decision to go my separate way. I cried out to God to help me, help us. Your testimony has been His answer and now I no longer feel hopeless and want to leave my husband. We just need to seek out godly counsel and trust in Him! Oh, trust in Him…I have struggled with trust for a long time now. I pray today is my new beginning of trusting in the One Who has summoned me by name and calls me His and promises to be with me as I pass through these waters. Thank you for your genuine faith and please pray for Jason and I. In these moments, I am in a difficult situation for me. 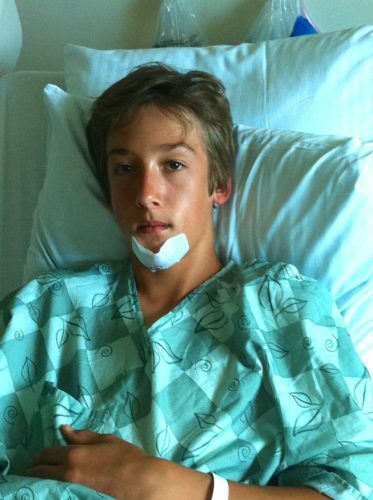 A month ago they found a node in the thyroid gland, and by January 29, they are going to perform a biosia. Not easy, I worry about the procedure and the result. On the one hand, my 8-year-old son and my husband are eager for the family to grow, but for now, because of my state of health, this plan must be postponed. And the work as an employee, are also in the plane of the unstable, I feel uneasy, changes have arisen and I do not feel strong, or prepared. Thanks Gwen Smith, for sharing these teachings are very valuable. Greetings from Colombia. I went through an experience similar to yours with my son but his was with Asthma in the hospital and I had that same peace from the Lord. It’s a peace you only receive from the Lord that no one ( human) can take or give. Thank you for sharing that today, and God Bless!!!! I needed this today. I lost my husband and best friend to brain cancer 3 years ago and some days still hurt as if it were yesterday. I often feel completely alone in this life although I have 2 beautiful young daughters and a sea of friends and family to help me through. I try to go at it alone most days, forgetting that God is the only one who can fill this void in my heart if only I’d let Him. Thank you for the reminder. Gwen, you have no idea how much I needed this reminder today. God knew! And I’m so glad. I love when He gets personal like this with us, don’t you!? I am so touched by your story. Your Motherly concern helped me to understand what my daughter was going through when her son was younger and fell on his skateboard & cracked his head. Also, now when he is struggling with addiction at 22. Now my daughter is calling me to help me with my housing situation. Even though she needs help. I did not know she was going tjrough this. Ad i struggle with a staying in a old cracked trailer of an angry roommate. Who is apparently struggling ad well. It isn’t ideal, but I am not homeless. Thank you God. He has chosen me as his daughter and to help thus woman financially. Even though I am uncomfortable. Jesus may need me to understand something. Thank you, Jesus, for using Gwen today to encourage my husband and me! We are approaching the 8th anniversary of our 18 yr old son’s death (in a car accident). 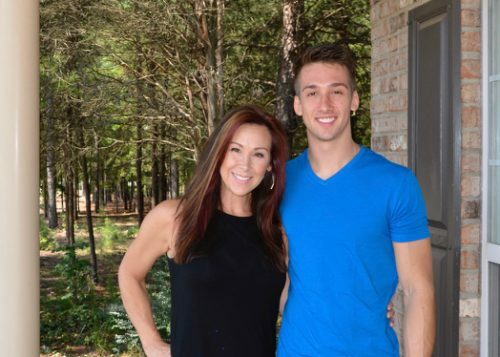 Not unlike your son, he is (not was) a handsome, talented, capable, God-fearing young man–blessed in so many ways…and now He is with Jesus, joyfully working for the Kingdom! However, the anniversaries, in particular, are such painful reminders of what we will not get to share/experience with our son on this side of heaven. When we chose our son’s cemetery stone, wanted to place a hopeful Bible verse that reminded anyone who passes by of the hope that we have in Jesus. We choose Isaiah 43:1a, “I have called you by name; you are Mine.” So to read those very words in your devotion as we approach his anniversary was God saying the same thing to us, “I am here. I will not leave you. 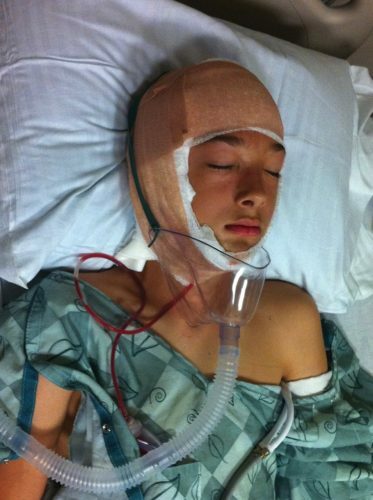 You are not alone…and Dustin (our son) is forever safe.” As much as we hurt, we are grateful. God is indeed good. Amen and amen. Sorry to hear of your struggles, Jackie. Pausing to pray for you now. This devotion spoke to me this morning and was exactly what I needed to hear. I am so glad to know that God is always with me and it is that assurance that keeps me going. Please pray for me. I am living with my brother and sister-in-law while I am looking for a job. I have had the flu for the past week and am down to my last $2.50. I could lose my car, my things in storage – everything. I am at the point of not knowing where to turn. People are always saying “call me if I can do anything” but when I do, they always seem to not be able to help. I honestly don’t know where else to turn other than to ask for prayers from Christians who know that prayers are heard and answered. So sorry, Marcia! My husband was displaced from his company in December, so we are in the thick of unemployment right now too. Praying for you now, friend. I used to think God was always there but the more I see my ex husband get away with lying, cheating, stealing, abandoning our girls, and take everything away from us to support his new family, I don’t feel it anymore! I’m about to lose our state Medicaid insurance this week because of his lies and selfishness. My 13 year old daughter is a type one diabetic with celiac disease and hypothyroid disease and she will die without her insulin and meds. My ex never sees the girls & I have no way how to take care of my girls now. My youngest still has 3 to 4 months with braces and I don’t know how to pay for the monthly appointments now. After being a stay at home mom for almost 13 years, I was forced into working full time to support my girls because he stopped doing anything 6 months after he divorced me behind my back! I’m daily asking God where He is because something bad happens at least once a month! My girls & I have no friends and everything from my family comes with strings attached. Now my ex wants to take the girls away from me because he was found in contempt of the divorce decree back in October! My girls are scared & so am I because we see him getting away with everything now! Carla, Thanks for sharing your struggle. I’m so sorry for the pain you’ve been going through. God does not promise to keep us from hard times, and the existence of them does not negate His presence. Jesus told us that we would have trouble, but that He is always with us and will give us strength and peace we need for each weak and hurting moment when we come to Him and share our burdens. Trust His heart, His provision and His presence – even when life hit hard, friend. He is faithful even when people are not. I’m praying for you right now, friend. Carla, Thanks for sharing your struggle. I’m so sorry for the pain you’ve been going through. God does not promise to keep us from hard times, and the existence of them does not negate His presence. Jesus told us that we would have trouble, but that He is always with us and will give us strength and peace we need for each weak and hurting moment when we come to Him and share our burdens. Trust His heart, His provision and His presence – even when life hits hard, friend. He is faithful even when people are not. I’m praying for you right now, friend. Thank you. I believe God is with me during the hard times I’m going through. I’m never alone. Please pray for my dying marriage of hurt & mistrust, & healing. God is with me . God is with me no matter my circumstances. He called me, not the other way around. Why would He not stay with me when things get really tough? I am NOT to fear; my job is to rely on Him, keep my eyes on Him, obey Him, and trust Him. Everything else will fall into place. Thank you so much for this. I am watching my son leave for the Army today. I have been just overwhelmed. I have cried so much and prayed so much. This is so hard. Your devotion has helped me so much. Just the right scripture I need for this day in my life. Thank you for this so much!!! Yes, I believe this for me. the passage of Isaiah I just read the promises of God are to fear not I will be with you always. He will never leave us in any situation. At times it hard but yet a peace can be in our hearts knowing he is with us. He also was saying He knows me and made me and because of that He will take care of me. In Isaiah 43:1-3, 5a God is telling us no matter what circumstance or situation we find ourselves in, even if it’s of our own making, he is always with us and will never leave us. We are not alone! I just want to Praise God for being God and God all by Himself. I thank Him for Grace and Mercy. I just Praise Him for His only begotten Son dying on Calvary’s cross for my sins and your sins. I so connected with your story today of your son. I just spent a beautiful vacation with my 2 daughters. They are grown and with families of their own. My one daughter seems to have a problem with alcohol. She says she “only drinks socially”, but it seems more than that, her husband is concerned as is other family members. I am concerned about her heart. Her Aunt passed at 54 of a heart attack, she will be 50 soon. I know God loves her more than I do. I give her to him daily. We lost a precious grandson to brain cancer a year and a half ago. What a heart breaking loss it was for everyone. But our daughter had now gone into a shell and we have little to no contact with her. It’s almost like a second death. Prayers would be greatly appreciated. Oh, Sandy! I’m so sorry for your loss. Praying for your daughter now. I loved your story and it resonated with me, but as my Mother’s daughter. Standing by her bed, in the hospital, as she lay dying, after several years of suffering with Alzheimer’s, I experienced a God filled moment. For the last few years, her beautiful blue eyes, had turned to a gray. The spunky, lively woman I knew as Mom, was now non-verbal, unable to feed herself and no longer showed any inkling that she recognized me. She simply was lying there, eyes closed, breathing with much difficulty, basically non responsive, but still alive. As the nurse was tending to her, I heard her say, “Ms. Elsie look at those beautiful blue eyes.” I quickly turned and looked. My Mom was looking up to the corner of the room with an amazed look on her face. Those beautiful blue eyes of hers, was the most brilliant I had ever seen. I cannot put into words how truly beautiful they were. 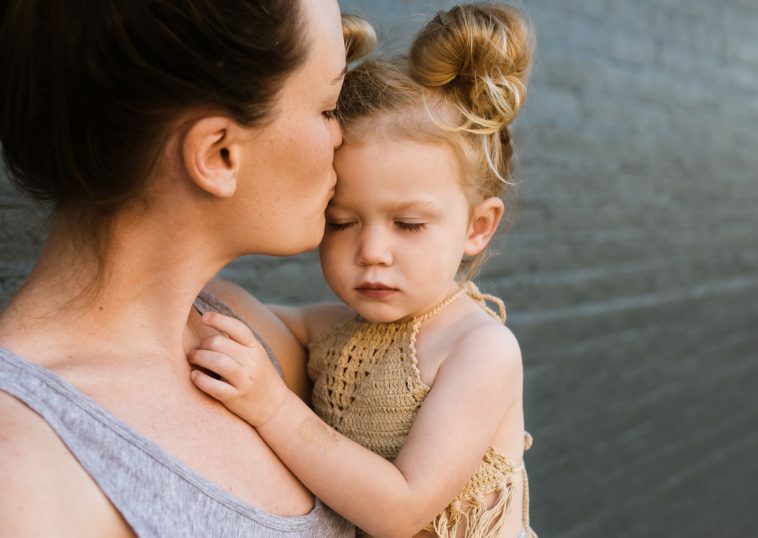 I spoke to her – “Mom, I’m here. Do you need anything? I want you to know how much I love you.” I looked up to the corner to see if I could determine what she was staring at. I could see nothing, but a corner of a room. I turned back to my Mom, I asked her – “Mom what do you see.” Then her eyes closed and she never opened them again. She passed away about 2 hours later. I truly feel she and I experienced God’s loving embrace at that moment. I felt his love for her and for me. He was letting her know, he was there to take her home. He let me know, she would be fine and I didn’t have to worry about her anymore. She would now be in his care. Life will go on. I will no longer have her in a physical form. No more suffering, no more sadness. I know, without any doubt, God was with us. As I sit here now, typing this post, I’m crying. I cry because I miss her so, even though it has been 6 years. I also cry because I still feel the love of God today, just as I did the day my Mom went to live with Him. Thank you for the beautiful words you write. Your words bring such hope and inspiration to those of us who enjoy your books, posts and inspirational thoughts. God Bless You. WOW, Debbie. What a treasure that the Lord allowed you that sacred moment prior to your mom’s passing. I’m sorry for your loss. My dad went to be with the Lord after years of suffering just two years ago. It’s so hard to lose a parent. But in it all, God’s faithfulness is truly amazing. My youngest daughter has Arnold Chiari brain malformation and had to have two brain surgeries during her second year of college. 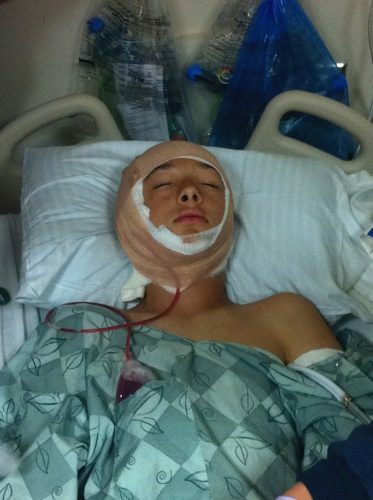 After her second surgery her Neurosurgeon said ” I’m so sorry , but I promise to keep her comfortable until she passes. ” I felt like I was dying myself. I begged God for mercy and HE responded ” I AM HERE AND ,SHE WILL LIVE .” That was eight years ago. 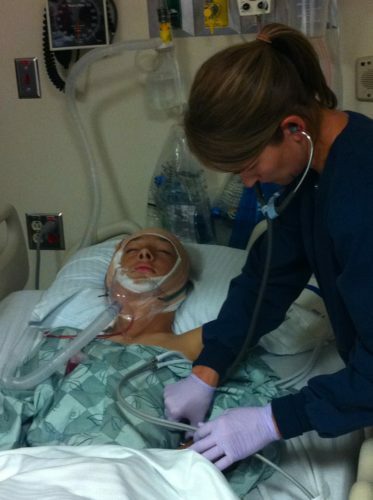 After 10 days in a coma, two more weeks in the hospital, she went back to college. She is now a Respiratory Therapist and Mother of two. Sister Gwen, I am heartfelt reading your story. As a Mom, I know how hard it is to hear how one of your kids has been hurt, and you are not by his side…I felt your pain, anguish, but most importantly, your Peace, when you turned to the only One, who can put this into perspective! My prayer is that one day, all will call out His Name! Thank you for this reminder! I need to ask a very difficult question, I’ve been deported to a country I don’t know leaving behind my American born husband and son, it’s been too heart broken years apart, with only face time and one visit from them. He has a great job, family and friends in Florida he is scared to move to another country and start over at 56 with out a job, home and have to move our son of 6 yeas t a country colombia where they know no one besides me and don’t speak the language, he has an elderly mother whom I’m sure he doesn’t want to leave. I want him to make the decision to choose our family over his fears to reunite our family, he cries with pain where ever we talk about it and he assures me of how much he loved vex me but has no idea of what todo? It’s killing us all the pain and anguish we feel and can’t seem to find a way out. I’ve been thinking of our family relocating to Canada to search for a job with hs company there, it would take a while before I could get my visa about a year or so, but we would be together, his fear is of leaving Florida , his job of 21 years to go to the cold unknown life in Canada, what am I to do, here w do I handle this situation? Do I give him an a time period to pick or family or to leave me behind? What am I todo? Please help, I need advice from all your readers to try to understand his hesitation to keep us together. I know he loves me and doesn’t want to loose us as a family, he spent $50,0000 dollars on lawyers to keep me from being deported. Please help me with what you or your husband would do if you were in our shoes. Any advice would be much appreciated. It was sad reading the story of your son , I hope you are all fine now. Thanks for sharing your story, Fabi. I’m so sorry for your pain and separation. While I don’t have any easy answers, I will take this to the One who does. Let’s pray… Holy Father, I pray for Fabi and her family. Please lead them with your Spirit, give them strength and wisdom to find the answers that are best for their situation, and surround them with love and support in the middle of their trial. In Jesus’ name, amen. I have been going through some very bad health issues. My prayer tonight was ” God, where are you, I need you beside me. Hold me tight.” This came at just the right time. 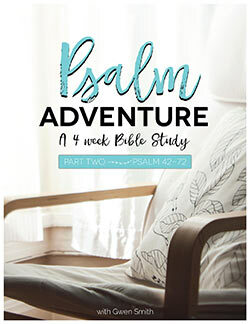 I am thankful for this study and for Girlfriends in God. I have been broken-hearted for almost twelve years. My precious husband of 30 years was diagnosed with cancer in September and passed in November 2002. The last years of our lives together were an adventure, revising two boys, working, and exploring this country we lived in. He touched many lives during his life, giving them the gift of laughter’ and the last two months of life were also a gift to many. He was always joyful and passed in peace. Jesus was with my sons and I during his last day and we were filled with joy knowing that he was walking with Jesus through eternity. II miss him every day, and wonder what adventures we would have had, but I know I will meet him and see the face of Jesus some day and spend eternity with Jesus. I am truly Blessed knowing that Jesus walks before me, and with me holding my right hand through the circumstances of my daily life. What a great devotional! Your sharing and the scriptures are close to my heart. This reminds me of the last few days of my mother who is passing. I remember sitting in the hallway praying and asking God for guidance. My heart was aching and I’m feeling confuse. I sat and look across the hall, there are babies being born. When my mother was admitted to the hospital, the only room available was the one across the delivery room. I though, God gave and God takes! When a life was taken another life is born, given. This is life, nothing is certain but God is certain. I know he’s there and listening to my cry. He will be with me all the way. I recide Ps 23:4 “Even though I walk in the valley of death, I fear nothing because he’s with me”. I felt peace as I remember his word. After my mother passed away and at the funeral, the pastor read Ecc. 12:7 “The dust returns to the ground it came from, and the spirit returns to God who gave it”. This verse brought me back to when I was praying by the hallway hearing babies being born. I realized my mother’s spirit is with God now. She’s safe now and in no pain. Even though I’m not ready to let her go but I know she’s with God, a far better place to be. These scriptures continue giving me comfort till today. My mother passed away almost 7 years ago and there is not a day I don’t think of her. Awesome and full of grace and truth. Thank you for sharing that in a way that I can also share it with another dear friend of mine who’s going through a lot of heartache and concern for her family today. And by the way, I watched the basketball video. Wow! But the thing that came to mind as I watched it was that God has such a great future for all those who trust Him and rely on His strength. Blessings! Thank you for this reading today! So many trials and tears since I have been trying to get back on the right track with the Lord. I’ve been trying to stay strong and to keep the faith that it’s all going to work out. Psalms 43:18 has been my go to verse along with Matthew 6:25-34! Anyways thank you again and blessings to you and your family! The past week has been a series of disappointments within my marriage and I surely needed this today. I know, in my head, that I am not alone and that He is with me through it all but when my heart is breaking and I am so lonely my head doesn’t always share that info with my heart. I am physcially alone alot; I work from home, my husband works 12 hour days and is going to start driving tractor trailer, and my older kids are all grown and out of the house. I do, however, have a 4 year old with Down Syndrome that I spend most of my time with and parent basically on my own. Spending time with The Lord is seriously the only way I get through some days. Thank you for this reminder and encouragement that was so definitely needed today. I had to pay extra attention to verse verse 2. “When you walk through the fire of oppression you will not be burned” NLT. Not if I walk through, but when I walk through. I’m praying his word becomes Rhema in every area of my life. I know he wasn’t addressing me at that particular time in history but it definitely applies now. Gwen, thank you for sharing this story this morning. It was as if God was speaking to my heart through your heart whisper. My life is in flux and I have been praying for the wisdom and grace to make the best decision, and I admit at times I’ve felt alone. Through today’s reading I see that God is my redeemer, protector, comforter, savior, that I belong to him, here’s ever present, and that He love me. Yep, I’m good now! Such a perfect reading today. Thank you. Whether our children are hurt physically, emotionally or spiritually, we are broken-hearted. Trusting that God is with me in praying for them & sharing His peace within me to trust His plan was the perfect reminder. Thanks.really neede this today.Dont know why but I have been in tears this morning.So thankful for the comfort of God.knowing He understands and loves me. What an incredible testimony of God’s goodness. Thanks so much for sharing this, Chris! Love it. It’s comforting and reassuring to know that God has summoned me by name. I am overjoyed to know that He promises to be with me no matter I go through. As my heart heals from hurts that I’ve recently endured, I am able to have peace knowing that God cares, that He’ll never leave me and that He’ll work all things together for my good because I love Him! Yes. His love is so comforting. Thanks for sharing your heart, Krissy. God promises to be there for us thru all circumstances, thru the valley and thru the fire. He promises in these scriptures that he is with us and for us not to be afraid. Its so encouraging to hear that this morning. I have a huge decision to make for my family and I feel so indecisive and alone and I’m afraid to make the wrong decision. I’m praying for wisdom, discipline and understanding from God. Ultimately, whatever decision I decide to make, God will be with me during this time, and he will continue to be with me. I don’t have to be afraid to make a bad choice because God is guiding me every step of the way. I just have to believe in his promises. When someone upsets me I can feel so totally alone in my pain and distress. It is just so amazing to be reminded God is right there and mends our broken hearts and crushed spirits even when that broken hard resulted from a fellow christian jumping on it.